We connect clients to new possibilities. We bring senior-level expertise to everything we do. We build lasting relationships to achieve powerful results. We are a strategic communications firm passionate about helping our clients connect to the right audiences with the right messages at the right time. From a strong grounding in PR and marketing communications best practices built on decades of experience, we are dedicated to helping organizations achieve long-term success. Our secret sauce: We consistently meet, deliver on, and exceed our clients’ expectations. Many choose to work with us year after year. Why? They know our senior-level professionals are with them every step of the way. 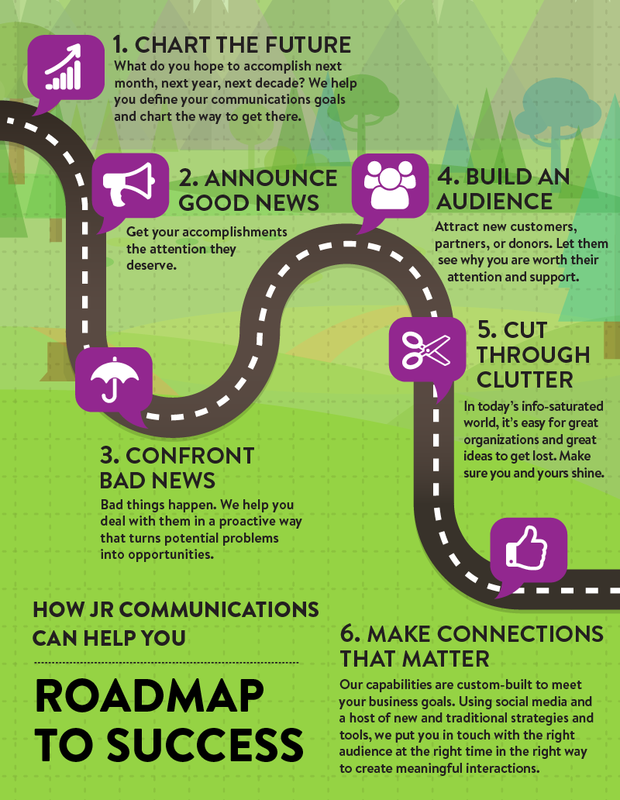 When you work with JR Communications, we listen to your needs, work with you to clarify the goals, and help you achieve more than you ever thought possible. You can count on us to offer honest counsel and consistent, dedicated follow-through. Are you a company with ambitious goals? A nonprofit with a mission to serve? A start-up with a huge vision? Have a specific goal you need to achieve? We will help you get to the next level—and beyond. Distinguish your story from everyone else’sWe make sure you tell the right story to the right audiences at the right time in just the right ways to help you cut through the clutter. Involve you in conversations that matterWe work with you to identify and propel you into the places and situations where you can best deliver your message. Position you and your organization as a leaderWe help you find and excel at opportunities to increase your presence, resulting in more customers, partners, donors and supporters. Offer wise counsel in tough situationsWe provide strategic, well-thought-out advice to help you manage sensitive situations effectively.